Ionic has been gaining in popularity as a free and open source mobile development framework. It leverages AngularJS and SASS to provide a quick start to mobile development for iOS, Android and Windows. 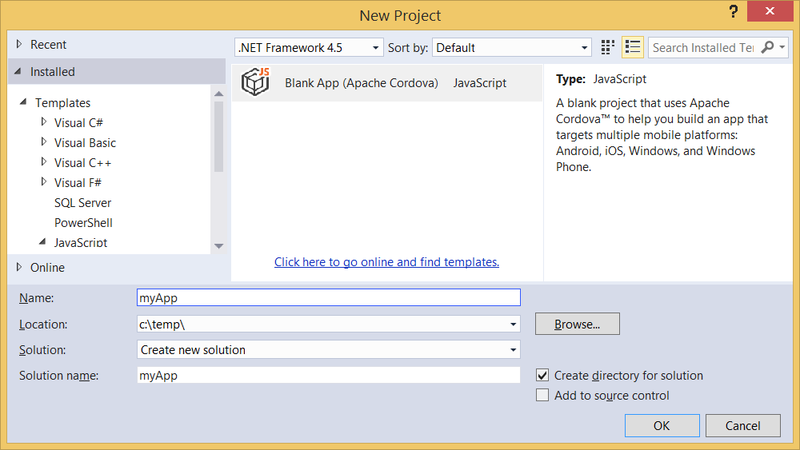 The newly released RC of Visual Studio 2015 Tools for Apache Cordova (VS TACO) makes it easier to create Ionic apps using two different methods. The easiest way (but not the best way) to create a new Ionic project using VS TACO is to use the new Ionic project templates, which are available on the Visual Studio Gallery. at the time of this writing, the templates do not work with Windows Phone and Windows apps. you are not guaranteed to get the latest Ionic CLI output when using the templates. not all of the Ionic CLI templates are included in the VS Templates. If any of these are issues for you, then continue to Method 2 below! This second method involves creating an Ionic project at the command line, and then importing the source into a VS TACO solution. The advantage of using this method is that you will be sure to have the latest Ionic template source, and you have full control over what you bring into your project. Be sure you have ionic installed - you can install by typing the following at the command line. NOTE: instead of tabs in the command above, you can also select blank or sidemenu. ... and copy them to the "myApp" folder that you created using Ionic in Step 2. Open the myApp.jsproj file from the Ionic folder. Select "Save All" so that a new Solution (.sln) file is created for this project. At this point, you can run your Ionic app against Android, iOS, and Windows. Go ahead and try it! Note that Ionic does not _fully_ support Windows and Windows Phone platforms, but the Ionic team is working on getting full compatibility with Windows platforms. When trying to run it on windows the app closes still being on the launch screen and I don't see what's the error. What about those security issues and jQuery described in the post for VS 2013 and CTP3? I guess this should be fixed with the winstore-jscompat.s? the winstore-jscompat js file that ships with VS2015 RC templates should be good to go (it has the fixes in it). I got this error when I build after perform all the steps. I had same problem like yours. Delete all folders in platform folder and rebuild the project. This solved the trouble for me.